Hedge Funds and other institutional investors have just completed filing their 13Fs with the Securities and Exchange Commission, revealing their equity portfolios as of the end of December. At Insider Monkey, we follow nearly 750 active hedge funds and notable investors and by analyzing their 13F filings, we can determine the stocks that they are collectively bullish on. One of their picks is DENTSPLY SIRONA Inc. (NASDAQ:XRAY), so let’s take a closer look at the sentiment that surrounds it in the current quarter. DENTSPLY SIRONA Inc. (NASDAQ:XRAY) has experienced a decrease in enthusiasm from smart money recently. XRAY was in 27 hedge funds’ portfolios at the end of December. 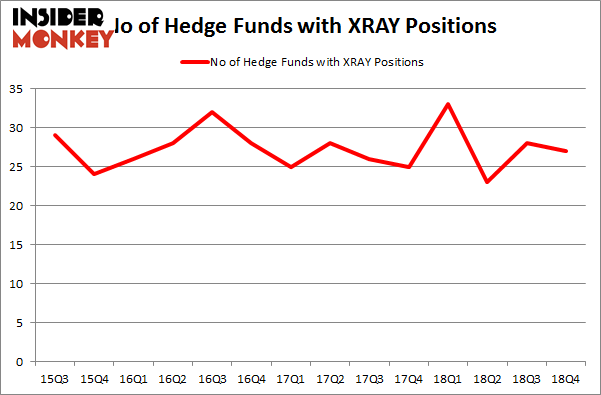 There were 28 hedge funds in our database with XRAY positions at the end of the previous quarter. Our calculations also showed that XRAY isn’t among the 30 most popular stocks among hedge funds. Let’s review the new hedge fund action regarding DENTSPLY SIRONA Inc. (NASDAQ:XRAY). How have hedgies been trading DENTSPLY SIRONA Inc. (NASDAQ:XRAY)? At the end of the fourth quarter, a total of 27 of the hedge funds tracked by Insider Monkey were bullish on this stock, a change of -4% from the previous quarter. On the other hand, there were a total of 33 hedge funds with a bullish position in XRAY a year ago. 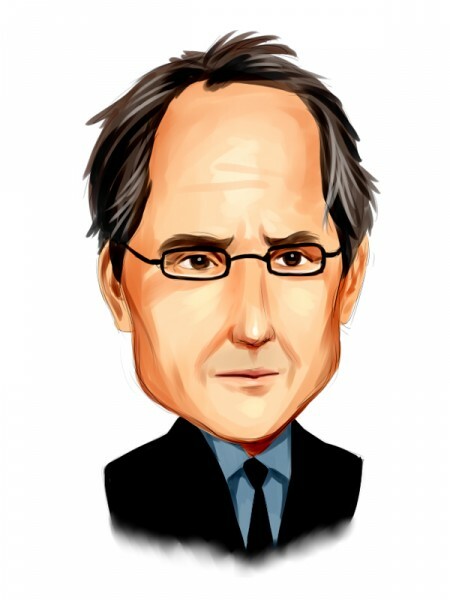 With hedge funds’ capital changing hands, there exists a few noteworthy hedge fund managers who were increasing their stakes substantially (or already accumulated large positions). Among these funds, Generation Investment Management held the most valuable stake in DENTSPLY SIRONA Inc. (NASDAQ:XRAY), which was worth $807.3 million at the end of the third quarter. On the second spot was Select Equity Group which amassed $182.9 million worth of shares. Moreover, Citadel Investment Group, Millennium Management, and D E Shaw were also bullish on DENTSPLY SIRONA Inc. (NASDAQ:XRAY), allocating a large percentage of their portfolios to this stock. Seeing as DENTSPLY SIRONA Inc. (NASDAQ:XRAY) has witnessed a decline in interest from the aggregate hedge fund industry, logic holds that there was a specific group of money managers who were dropping their full holdings by the end of the third quarter. Intriguingly, Jeffrey Ubben’s ValueAct Capital said goodbye to the biggest investment of the 700 funds tracked by Insider Monkey, comprising an estimated $83 million in stock. Samuel Isaly’s fund, OrbiMed Advisors, also said goodbye to its stock, about $71.3 million worth. These moves are intriguing to say the least, as aggregate hedge fund interest fell by 1 funds by the end of the third quarter. Let’s check out hedge fund activity in other stocks – not necessarily in the same industry as DENTSPLY SIRONA Inc. (NASDAQ:XRAY) but similarly valued. These stocks are Tata Motors Limited (NYSE:TTM), Trimble Inc. (NASDAQ:TRMB), Targa Resources Corp (NYSE:TRGP), and Camden Property Trust (NYSE:CPT). This group of stocks’ market valuations are closest to XRAY’s market valuation. As you can see these stocks had an average of 20 hedge funds with bullish positions and the average amount invested in these stocks was $347 million. That figure was $1421 million in XRAY’s case. Targa Resources Corp (NYSE:TRGP) is the most popular stock in this table. On the other hand Tata Motors Limited (NYSE:TTM) is the least popular one with only 9 bullish hedge fund positions. DENTSPLY SIRONA Inc. (NASDAQ:XRAY) is not the most popular stock in this group but hedge fund interest is still above average. This is a slightly positive signal but we’d rather spend our time researching stocks that hedge funds are piling on. In this regard TRGP might be a better candidate to consider a long position. Our calculations showed that top 15 most popular stocks among hedge funds returned 21.3% through April 8th and outperformed the S&P 500 ETF (SPY) by more than 5 percentage points. Hedge funds were also right about betting on XRAY as the stock returned 35.5% and outperformed the market as well. You can see the entire list of these shrewd hedge funds here.